Chevron put the Oilfield M&A game in motion on Friday, with their announcement of a cash and stock offer for Anadarko Petroleum. The oil industry is ripe for some M&A activity, as the nice premium of about twenty percent that was offered to the prior closing price, seems to indicate. I think a case can be made for exceptionally well-rounded oil companies to be high on the lists of potential acquisitors in the hunt for value. One such company is Apache Corporation. In this article we will take a look at to why I think they could be the next domino to fall. Oil equities are under-valued at present by thirty or forty percent, taking the recent performance of the XOP index as an example, in relation to the price of oil. From the Dec. 24th, 2018 low, the XOP has regained about 30% of its pre-crash level, while oil has nearly doubled. Anadarko makes up about 2% of the XOP. Over the past year we have seen valuations decline anywhere from 25-40%. The market typically over or under reacts with equities tied to commodities in particular. 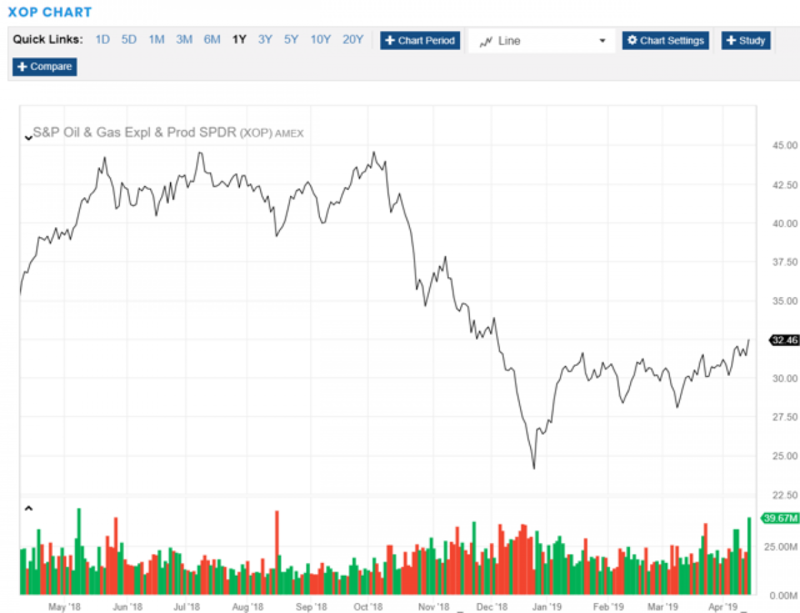 When the underlying commodity loses value as oil did in the fourth quarter of 2018, shares can fall precipitously. The three month period ending December, 24th 2018 is reflective of this condition. We have seen a sharp "V" shaped recovery since, as was expected. One of my favorite expressions from tenth grade geometry still rings true, “The angle of incidence equals the angle of reflection.” It’s been a strong recovery, but we have still have not regained the highs of Q-3, 2018. Friday's action by Chevron could be an inflection point for multiple expansion in oil equities. • The Fed tapping the brakes on the tightening policy of the last couple of years. • The repeated declaration of the Saudis to raise global pricing, through declining exports to the U.S.
• The chaos in Venezuela and imminent (eternal) civil war in Libya are providing concerns about supply. • Some signs that shale drillers are taking a drilling pause to let prices improve a bit. • Signs that shale productivity may be leveling off, i.e. more inputs being required to maintain current levels. • The generally positive comments coming out of the China trade talks. Chevron might have just delivered this inflection point last Friday. What changes things for North American shale post the Chevron/Anadarko tie-up? We have been inundated with theories about shale peak-ing out in recent times. You've may have read them... the ones by Martenson and Berman stand out in particular. In this one, and in others very cogent arguments have been made, that growth trajectory of shale plays is in decline due to poorer rock quality than in the past. Some, like Jim Chanos posit a very dark interpretation of shale results so far, that's it all been a hoax. The words "Ponzi Scheme" are used frequently by the doom sayers. It is not my intention to challenge any of these pundits squarely today. They may very well be right, time will tell. What I do want to address in this article is an element of market activity being ignored by the "doom crowd." The clever arguments put forward for shale slipping (crashing?) into decline, have managed to ignore one simple fact. The shale-doom crowd chooses to ignore the obvious, and frankly, the most compelling pro-argument for shale that exists. Big Oil is committing resources to shale in droves. Companies are falling over each other in the attempt to land big "Shale" fish, like Anadarko. And, in so doing have laid out ambitious growth plans for this resource. BP, (BP), ExxonMobil, (XOM), and now Chevron. What are they telling us by voting for shale with their capex dollars? It's simple really. They are saying that their geophysical teams-which, let's acknowledge are the best in the business, have told them that with scale, they can wring more oil and gas for less money than any other equivalent investment. What scale brings is a low base cost of production, which when combined with the high technology these companies can bring to bear on a project, turns into profits and free cash flow. "This deal enables us to compete in any oil price environment, produce synergies from the combination of the two companies, and be accretive to earnings in the first year." A point worth making, and one made by Mr. Wirth, was that it's not only Anadarko's shale acreage drawing their interest, but the global footprint of this company aligning so closely with theirs in deepwater and international. But make no mistake, Anadarko's shale acreage is the linchpin in this deal. None of the above is really very complex is it? it all adds up to a very compelling investment scenario for our production hungry Super Majors, and perhaps foreign companies looking to establish a foothold in this prolific basin. In my view, Chevron and Anadarko getting together is just round one of the oil asset consolidation wave that will come. Apache's, (APA) stock popped nicely on the CVX/APC news, as did many shale players, but fell back a bit as the day wore on. I read nothing into that event. Alpine High is a massive block of about 300K contiguous acres that has been estimated to contain 3 bn BBOE. As you can see from the slides below, the Alpine High development is skewed to Wet Gas. Wet gas is basically the heavier end of the hydrocarbon molecule with more carbons attached, making them heavier, and tending toward a liquid phase. Dry gas is defined as being 85% methane or better. One of the things that's been a drag on Apache's stock was the limited take-off capacity for dry gas. Once Kinder Morgan's, Gulf Coast Express-GCX, line goes into service, later this year, those concerns go away. Apache was one of original subscribers to the GCX, 500 MMCF/D guaranteed take-off. Cryogenic capacity is the next piece of the puzzle. To turn wet gas into dry gas the heavy ends are first concentrated and removed from the gas stream cryogenically. These units will come on stream this year. The billion or so dollars of capex that's been required to process wet gas has also been a drag on the stock. The market gives you nothing for investing for the future, it's only interested in what's happening now to produce profits. The goal of this section has been to establish that Apache has built a singular asset in the Permian basin with the capacity to make immediate contributions to cash flow. All aspects of the production cycle appear to be in place. • Processing infrastructure in place as capex winds down. • Take-off agreements in place with third parties for gas delivery to sales markets. 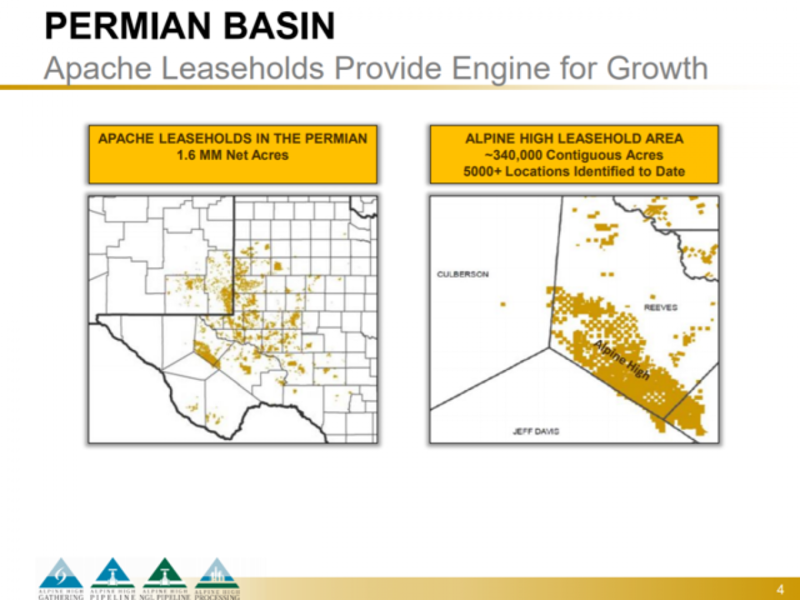 But, Apache is more than just its Permian assets. Not discussed in this article for the sake of brevity are the other assets. We'll bulletize them now for completeness. 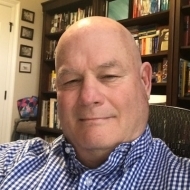 • Altus Midstream, Altus Midstream was formed as a JV with Kayne Anderson to service Alpine High's needs. It will be operated as a standalone C-Corp with Apache owning 80%. Trading currently at $5.85/share, it currently boasts a market cap of $1.9 bn. • Egyptian PSC Apache has operated in Egypt for a number of years, and has recently been awarded new Production Sharing Concessions, PSC's that give it many years of expansion potential. • North Sea Apache entered the North Sea with the 2012 purchase of ExxonMobil's, Beryl field, and later with the acquisition of BP's Forties Field. In that time it has found significant new amounts of oil. Garten, produced from Beryl Alpha platform has already produced over a million barrels of oil, with additional recoverable reserves of 9-10 mm bbl. Apache has identified two new drilling locations based on the success of Garten. • Suriname The area on the in-set map outlined in gray with the multiple green dots represents XOMs Stabroeck field development. If you read news related to energy topics, you have to be familiar with Stabroeck. It's the most significant exploration discovery in the western hemisphere in many years. Apache holds a PSC from Suriname for blocks directly adjacent to Stabroeck, and inline with the trend of announced discoveries in that field. Apache drilled a duster in Block 53 back in 2017. Now after examining seismic data for a couple years it's ready to try again in Block 58, later this year. Success could profoundly impact Apache, as XOM has found nearly 4-bn bbl so far in Stabroeck. Apache owns 100% of Block 58.
Who might be interested? Obviously Shell, which has publically stated as being in the market for a Permian acquisition. Perhaps Occidental Petroleum, (OXY) (which might be a target all by itself)? OXY was in the hunt for Anadarko, and actually outbid CVX on per share basis. There are some who feel there may be another shoe to drop in this matter. Anadarko shareholders have to be rubbing their hands with glee at this prospect, as any new bid would now have to account for the $1 bn breakup fee in the agreement with CVX. Apache is a prime target to be snapped up a global Super Major, or National Oil company. The game is afoot, thanks to Chevron. All we can do now is wait. Of course, nothing may happen at all in this regard. You never can tell the future with any accuracy. My view though, we won’t have long to wait!